The initial signing date for the NCAA National Letter of Intent is quickly approaching. The one-week signing period begins Wednesday, November 11. This signing period applies to Division I and II baseball programs and many other Division I and II sports. What exactly am I signing when I sign the National Letter of Intent? You’re signing a commitment to attend that university for one full academic year in exchange for an athletic scholarship. The National Letter of Intent must be accompanied by an athletic scholarship agreement from the college that is recruiting you, and you’ll also be signing that scholarship agreement. 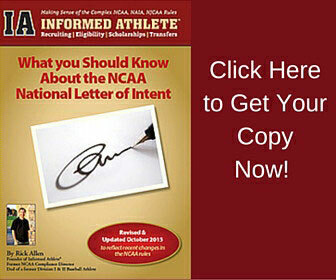 Can I sign a National Letter of Intent if I’m not being offered an athletic scholarship? What happens if I don’t attend the university that I’ve signed with for at least one full academic year? Does a Letter of Intent from a junior college or an NAIA college work the same way? When you purchase this ebook, you’ll also receive an information sheet explaining the differences between the NCAA National Letter of Intent and the NAIA and NJCAA Letter of Intent programs. To learn more about how we help athletes and families like you, visit Informed Athlete for more information about college recruiting, eligibility, scholarships, and transfers. For further information, contact us at 913-766-1235 or rick@informedathlete.com. • Conducts compliance reviews and audits at NCAA Schools throughout the U.S.